An international team led by scientists at The Scripps Research Institute (TSRI), the Howard Hughes Medical Institute and Albert Einstein College of Medicine of Yeshiva University has identified a highly promising new anti-tuberculosis compound that attacks the tuberculosis (TB) bacterium in two different ways. “These findings represent an effort to help solve one of the major global health crises of our time—the resurgence of TB and its dangerous drug-resistant strains,” said Peter G. Schultz, the Scripps Family Chair Professor of Chemistry at TSRI, who was senior author of the study with William R. Jacobs, Jr., member of the Howard Hughes Medical Institute and professor of microbiology & immunology and of genetics at Albert Einstein College of Medicine. “In cell cultures and in mice, this compound showed powerful activity against ordinary active TB bacteria, non-replicating TB bacteria and even extensively drug-resistant TB strains,” said Feng Wang, a member of the Schultz lab at TSRI and first author of the study with Dhinakaran Sambandan of the Jacobs lab and Rajkumar Halder of the Schultz lab. The paper appears in this week online ahead of print in an Early Edition of the Proceedings of the National Academy of Sciences. Although isoniazid and rifampin, the two front-line TB drugs, came into use in 1952 and 1967 respectively, new TB infections still occur at the rate of roughly one per second. At any moment about a third of the existing human population is infected—mostly with inactive, latent TB, although active TB still kills over one million people each year. Russia, Africa, China and Southeast Asia have been especially hard hit by the epidemic. Increased urbanization, public health complacency and immunity-weakening HIV have been major enablers of TB’s spread in recent decades. 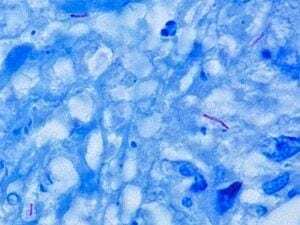 But the bacterium that causes TB—Mycobacterium tuberculosis (Mtb)—also happens to be unusually well adapted for persisting in humans. Among other strategies, it frequently reverts to a dormant, non-replicating state and also creates attack-resistant cell colonies called biofilms, which contain a high proportion of non-replicating TB. Compared to ordinary, fast-replicating TB, these other forms of TB are much less susceptible to existing drugs. Effective TB therapy thus requires months to years of regular dosing. But many patients quit before completing such long courses of treatment and end up incubating drug-resistant TB strains. Some strains are now “extensively drug-resistant” (XDR) and virtually untreatable—and usually fatal. “The big challenge here has been to find a drug that clears TB infection more quickly, which means it has to be effective against both replicating and non-replicating TB,” said Wang, now also a scientist at the California Institute for Biomedical Research (CALIBR), a non-profit organization founded by Schultz for the early-stage development of new medicines. Most existing TB drugs work poorly against non-replicating TB, having been developed principally for their ability to kill actively replicating TB. Wang therefore set up a different kind of screening test—one to detect compounds that block TB’s persistence-related ability to form biofilms. Because experiments with live TB require a special (level 3) biosafety facility, Wang used a related but non-disease-causing mycobacterium for his initial, high-throughput test. Screening a diverse library of 70,000 compounds, he quickly found one, dubbed TCA1, that stood out for its ability to inhibit mycobacterial biofilms. Tests in Jacobs’s biosafety level 3-certified laboratory confirmed that TCA1 also has powerful activity against TB. “Surprisingly, it turned out to kill both non-replicating and replicating TB,” Wang said. In cell culture tests, TCA1 on its own killed more than 99.9% of ordinary, actively replicating TB bacteria within three weeks, and in combination with isoniazid or rifampin, could kill 100% within that period. TCA1 also showed strong effectiveness against drug-resistant TB strains, removing all signs of one common strain within a week when combined with isoniazid. Against a highly fatal “super-bug” strain from South Africa, which resists all conventional TB drugs, the new compound on its own had a kill rate of more than 99.999% within three weeks. As expected, TCA1 also showed potent effects against non-replicating TB. Tests in mice confirmed TCA1’s effectiveness and suggested that the combination of TCA1 and isoniazid could be more powerful than existing drug regimens. TCA1 showed no sign of toxicity or adverse side effects in cell culture and mouse experiments, and also showed almost no tendency to induce drug resistance in TB.